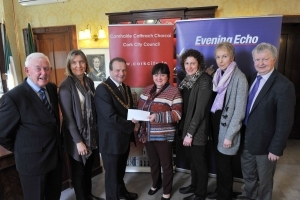 Friendly Call Cork honoured with Lord Mayor’s Charities Fund donation » Comhar Chathair Chorcai Teo, Cork City Partnership Ltd. Friendly Call Cork and Cork City Partnership of funds raised by Lord Mayor’s Christmas Concert were Barry Woods, Jacqui Sweeney, Lord Mayor of Cork Cllr. Chris O’Leary, Teresa Stokes, Brenda Barry, Marian Hodder and Seamus Hennessy. Friendly Call Cork, a programme under the remit of Cork City Partnership, was recently honoured with a substantial donation awarded to them in Cork City Hall. On 31st March, Cork City Lord Mayor Cllr. Chris O’Leary presented the team of Friendly Call Cork with a donation of €3,000 from proceeds of the Lord Mayor’s Charity Ball & Christmas Concert. Friendly Call Cork is absolutely delighted to have received this funding. Friendly Call Cork is a free service providing a phone call 5 days a week and is available to older people or individuals who may feel lonely, isolated and vulnerable. The service specifically targets people with chronic illness or anyone who cannot engage in an active way in the wider community. The Friendly Caller will chat to clients about their day and check on how they are feeling, providing friendship, security and helping clients feel safer at home. We would like to acknowledge the funding of the HSE and the Department of Health which contributes towards the costs of running this service. The Lord Mayor’s Charity Ball & Christmas Concert are held annually. Each year both events have ensured that local Cork charities are in a position to provide assistance to those in our community who need it most need. Given the current challenging economic environment, it is vital that charities and voluntary organisations are supported to continue doing the good work they are doing in our communities. We are so grateful to Lord Mayor Cllr. Chris O’Leary and the hardworking committee that organise these fundraising events to support Cork Charities. We are delighted to now have the opportunity to further expand our services; we plan to pilot two new services to include a visitation service and a social car scheme for those individuals who may need transport and support when attending hospital appointments. We cannot overstress how important this funding is to us. Thank you Lord Mayor, Cork City Council and all those who contributed to the Charity Events that raised the funding.